The anterior cruciate ligament is one of the major stabilizing ligaments in the knee. It is a strong rope like structure located in the center of the knee running from the femur to the tibia. Anterior cruciate ligament is one of the four major ligaments of the knee that connects the femur (thigh bone) to the tibia (shin bone) and helps stabilize your knee joint. The ACL prevents excessive forward movement of the lower leg bone (the tibia) in relation to the thigh bone (the femur) as well as limits rotational movements of the knee. It also is a ligament that provides stability to the knee joint. It is commonly injured during high-intensity sports. When this ligament tears, unfortunately, it does not heal and often leads to the feeling of instability in the knee. How do you Diagnosis an ACL Tear? Knee injuries that involve the ACL usually cause complete or near complete tears that require surgical reconstruction. An ACL injury can be diagnosed with a thorough physical examination of the knee and diagnostic tests such as X-rays, MRI scans and arthroscopy. X-rays may be needed to rule out any fractures. In addition, your doctor will often perform the Lachman’s test to see if the ACL is intact. During a Lachman test, knees with a torn ACL may show an increased forward movement of the tibia and a soft or mushy endpoint compared to a healthy knee. What are the Types Of ACL Surgeries? ACL reconstruction is a commonly performed surgical procedure and with recent advances in arthroscopic surgery can now be performed with minimal incision and low complication rates. The goal of ACL reconstruction surgery is to tighten your knee and to restore its stability. ACL reconstruction is usually performed 3-8 weeks after an injury once the swelling has reduced and the range of movement is improved through rehabilitation. This prevents stiffness and scar formation after surgery. Anterior cruciate ligament reconstruction hamstring method is a surgical procedure to replace the torn ACL with part of the hamstring tendon taken from the patient’s leg.The hamstring is the muscle located on the back of your thigh. The procedure is performed under general anesthesia. Your surgeon will make two small cuts about 1/4 inch long around your knee. An arthroscope, a tube with a small video camera on the end is inserted through one incision to see the inside of the knee joint. Along with the arthroscope, a sterile solution is pumped into the joint to expand it enabling the surgeon to have a clear view and space to work inside the joint. The knee is bent at right angles and the hamstring tendons felt. A small incision is made over the hamstring tendon attachment to the tibia and the two tendons are stripped off the muscle and the graft is prepared. The torn ACL will be removed and the pathway for the new ACL is prepared. The arthroscope is reinserted into the knee joint through one of the small incisions. Small holes are drilled into the upper and lower leg bones where these bones come together at the knee joint. The holes form tunnels in your bone to accept the new graft. Then the graft is pulled through the predrilled holes in the tibia and femur. The new tendon is then fixed into the bone with screws to hold it into place while the ligament heals into the bone. The incisions are then closed with sutures and a dressing is placed. Anterior cruciate ligament reconstruction patellar tendon is a surgical procedure to replace the torn ACL with part of the patellar tendon taken from the patient’s leg. The new ACL is harvested from the patellar tendon that connects the bottom of the kneecap (patella) to the top of the shinbone (tibia).The procedure is performed under general anesthesia. Your surgeon will make two small cuts about ¼ inch around your knee. An arthroscope, a tube with a small video camera on the end is inserted through one incision to see the inside of the knee joint. Along with the arthroscope, a sterile solution is pumped into the knee to expand it providing the surgeon a clear view of the inside of the joint. The torn ACL will be removed and the pathway for the new ACL is prepared. Your surgeon makes an incision over the patellar tendon and takes out the middle third of the patellar tendon, along with small plugs of bone where it is attached on each end. The remaining portions of the patellar tendon on either side of the graft are sutured back after its removal. Then the incision is closed. The arthroscope is reinserted into the knee joint through one of the small incisions. Small holes are drilled into the upper and lower leg bones where these bones come together at the knee joint. The holes form tunnels in your bone to accept the new graft. Then the graft is pulled through the predrilled holes in the tibia and femur. The new tendon is then fixed into the bone with screws to hold it into place while the ligament heals into the bone. The incisions are then closed with sutures and a dressing is placed. The procedure is performed under general or local anesthesia. 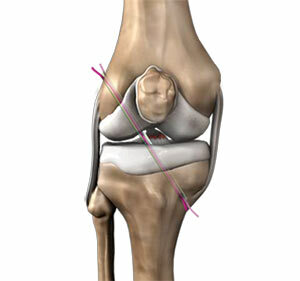 Your doctor will first evaluate your knee under anesthesia to assess the damage to the ACL and other structures. Following this, a portion of the patellar tendon along with its area of attachment to the shin bone and kneecap is obtained and prepared to be used as a graft. Small incisions are then made over the knee to insert an arthroscope and other surgical instruments. The arthroscope consists of a tube with a light and camera to view the inside of the joint. The structures within the knee are evaluated and any significant injuries are identified and repaired during the surgery. Tunnels are created by drilling through the shin bone and thigh bone. The graft is passed through these tunnels and secured with screws to replace the original ACL. The incisions are then closed with sutures and covered with dressings. The procedure takes about 1-1/2 to 2 hours. ACL reconstruction with a “bone-patellar tendon-bone” graft has the advantage of better outcomes when compared to other forms of therapy or other grafts and the patellar graft is also easily obtained. Disadvantages of this surgery include pain in front of the knee, especially with kneeling, from harvesting the patellar tendon. The procedure is not recommended for children with growing bones. What are Risks and complications with ACL Surgery?